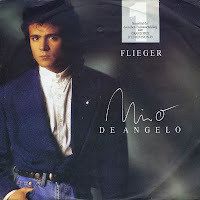 'Flieger' ('Flyers') was the German entry for the 1989 Eurovision Song Contest, performed in German by Italian singer Nino de Angelo. Five years before, De Angelo had his breakthrough with 'Jenseits von Eden', a number 1 hit in Germany and Switzerland, and a top 10 hit most of Europe. This Eurovision song was composed by Dieter Bohlen, internationally best known as one half of the very successful German Europop duo Modern Talking. The song finished 14th in a field of 22 competitors.